The Director's Chair: Once is not enough! There are costs associated with being successful; the demands on our time and talents escalate exponentially. Don’t misunderstand me, I’m not complaining. It is great being in demand and acknowledged. Right about now, though, I’m thinking about the benefits of cloning. By the way, where are we in the debate to legitimize cloning? It’s nice to believe that if we put something in we’ll get something back out; the larger the deposit the greater potential for a larger withdrawal. Teaching this concept to my daughter was a difficult task. “Daddy, if you don’t have any money, just go to the MAC machine and get some.” We all k now there is so much more to the “deposit-withdrawal” equation. How we go about getting “it” so we can deposit “it” is truly what’s at issue here. Fundamentally, we must all ask, from whence commeth the substance of our deposits? Dealing art is risky; no risk-no reward. High risk - high yield. The Knapp Gallery’s investment in Christopher Callahan is paying off with large dividends. Am I saying that taking on Chris Callahan was risky? No, but holding to my overall platform of supporting and promoting Philadelphia artists is. While, my competitors continue to show painters from New York, London and around the world, relying on an address to promote sales, I’m committed to my mission of promoting emerging Philadelphia talent; kudos by the way to Richard Rosenfeld, of The Rosenfeld Gallery who has a great show up by Philadelphia artist Richard Ranck, a Philadelphia Academy graduate. As a cog in a seemingly broken wheel, I’m paying my dues into resurrecting a worthy machine; a sustainable Philadelphia Art Community. In my mind, however, this is but a taste of success. I am rarely satisfied, wanting so much more for my painters and Philadelphia. There are varying degrees of success. As a result, measuring success gets a bit tricky. Empirical data, the stuff one can count, beyond sales, the calls (both from in and out of state), queries, requests for additional information, is what I ’m really talking about. 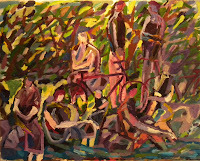 The Callahan show has caused lot’s of buzz; so much so that we are extending the Callahan exhibit through October 31st. 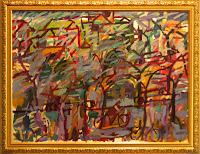 We will however be swapping out the remainder of the current show with an extensive look at his impressionistic work. It is becoming readily apparent; I am not alone in my efforts to create awareness of the latent wealth found in Philadelphia’s art history and present day remnant. Known as the countries’ largest mural arts program, in my mind, diminishes the collective value of Philadelphia’s vast “high-end” art resources. Recently asked by a friend, from New York, "Why would the culture vultures turn their gaze to Philadelphia?" I’m compelled to respond; only briefly though. For starters, The Barnes Foundation, considered by many as the world’s greatest private collection of French i mpressionism and post-impressionism works, affords Philadelphia a significant place of notoriety. Beyond “the collection,” though lacking formal accreditation, the decades of Barnesian teaching distinguishes Philadelphia as a cultural center. The truth be told, I’m not surprised by the overwhelming response to the Callahan exhibit. The stars were aligned; timing is everything. I stepped out on faith and followed up with my best efforts. Increased traffic and visibility necessitates a commensurate response. 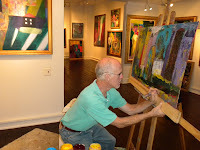 To accommodate the increased weekend “traffic”, Chris set up his easel and has been painting here at the gallery. The authenticity of Callahan’s art bolsters his resolve and creativity before an audience. He is neither intimidated nor is his stream of consciousness interrupted; he actually enjoys the conversation. Looking around, I see a plethora of acknowledgeable work; it is not so simple isolating our mission from the hard and fast reality of making the rent. Fortunately, The Knapp Gallery owners share my vision of contributing towards a sustainable Philadelphia Art Community.